The historic gardens around the villa cover an area of about a hectare; they still have their original Italian design, evidence of which can be seen in plans dating back to 1878, with perpendicular avenues lined by box hedges, and with an exedra at each intersection. At the centre of the main exedra is a small temple made out of white stone. Along the driveway the hedges are over 4 metres high, ensuring privacy for the family and keeping the gardens safe from prying eyes. The pride of the gardens are its fully mature hackberry trees, pines, cycads, myrtles, and even two rows of date palm along the north-south axis and a double row of jujube and winter strawberry to the southwest. The tree species are mainly Mediterranean, such as the dwarf palm, the false pepper, Judas tree, and limes, while there are also non-native species, including the beautiful silk floss tree (Chorisia speciosa), large clumps of yucca, some specimens of parkinsonia and a magnificent specimen of black paperbark (Melaleuca lanceolata), with its particularly striking June blooms. To the northwest, there is also a grove made up of various pine, chinaberry (Melia azedarach) and mulberry trees, as well as a specimen of ficus. In addition to the historic gardens there are two outdoor areas, covering about one hectare. 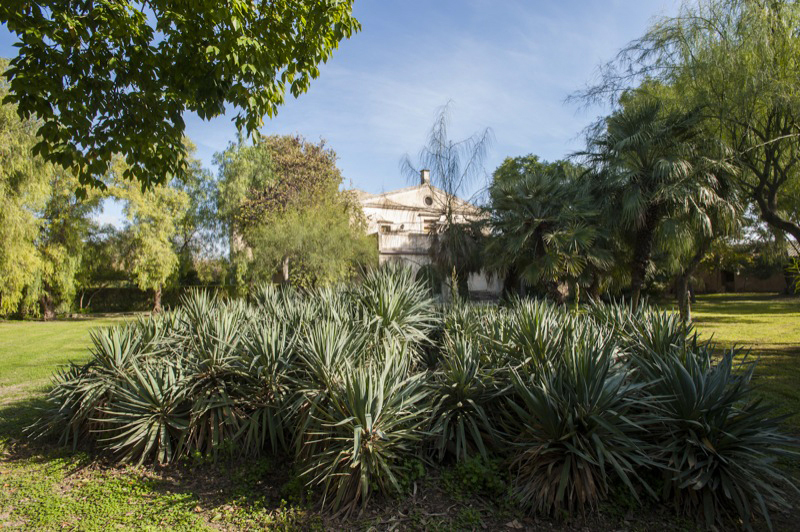 To the south is a maze of dwarf palms, bordered by ancient of white mulberry trees, left over from the silkworm industry, while to the north-west around a pond is a collection of palms, pistachios, cork oaks and magnificent ancient carob trees. 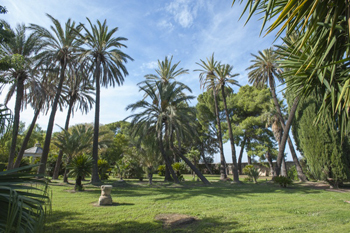 Since 2012, the gardens have been included in the GardMed project featuring the Mediterranean gardens of Malta and Sicily.